UFC is one of Thailand’s leading companies of beverages and processed fruits & vegetables, was founded in 1969. We take pride that all our products are nutritious, delicious, and safe for consumption. Our products are available in many countries through our partnership with our international distributors. We are committed to be a responsible corporate citizen with our various CSR programs. UFC Longan in Syrup is made from finely selected Edor Longans, which have a tender sweetness and soft yet crunchy textures. Our preservation process translates to fresh and natural longan flavours, which can be consumed on its own, or as a component in deserts or savoury dishes. 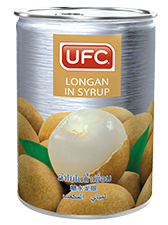 We highly recommend slow cooking UFC Longan in Syrup with sweet sticky rice, a renowned traditional Thai dessert.